Since taking the Patriots head coach position in 2000, Bill Belichick has racked up an enviable track record. He's the only head coach to win 3 Super Bowl Championships in a four year span and he's ranked six all time in NFL wins with 205. 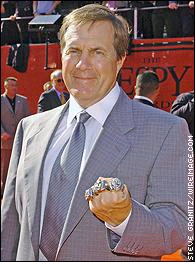 Importantly, Mr. Belichick has a winning percentage of .653, the third highest in NFL history. You don't become that good without having discipline, sticking to it and knowing when to make the rare exception. Those successful traits aren't limited to just football. In fact, if Mr. Belichick were teaching you how to buy winning stocks, he'd probably turn to his playbook and use these 16 lessons -- one for each week of the regular season. 1. Defense is critical to success. Bill Belichick held primarily defensive coaching positions from the late 1970's until 2000. As a result, a strong defense is critical to his game winning strategy. Since markets fall more quickly than they rise, a good defense is a winning strategy for investing too. Controlling your risk through diversification and a prudent sell discipline will help you protect account values when markets sour, giving you a bigger base to build on when markets eventually rally. 2. Control the clock. Managing the play clock is an important weapon Belichick uses to set game play cadence. Sometimes, the hurry up offense is best. Other times, using all the time on the clock makes more sense. Markets don't operate in a bubble either. Any number of outside influencers means you'll need to adjust your strategy when stocks become over bought or oversold. As a result, making smart choices about where markets may go can keep you from missing an opportunity when the clock runs out and the tide turns. 3. Stick with your winners. There's a reason Tom Brady has been under center for the past 12 years. The Patriots may not have known how good Tom Brady would eventually become when they drafted him in the 6th round out of University of Michigan. But, once they gave him the ball they've made him the cornerstone of their offense. Much like Mr. Brady, companies like Google grew into greatness, dominating their market. While portfolio management dictates normalizing the weight of winning stocks as they climb, selling winners for the sake of selling may not be the best choice. 4. Don't be afraid to sell high. In the three year stretch from 2007 through 2009, Randy Moss caught 250 passes for 3765 yards. He scored 47 touchdowns in the period, including 23 in 2007 alone. And despite coming off the 2009 season playing all 16 games and averaging 79 yards per game, Mr.Belichick was still willing to let him go in 2010. Whether it was because of personal issues, contracts or some other reason, Coach Belichick was willing to weigh Randy Moss's value and decide it was time to sell high. Taking a similar approach to your portfolio means welcoming information and always evaluating the risk and reward of even your best holdings. Sometimes, that will mean selling a big winner like Apple Computer when everyone else thinks you should be buying. 5. Its okay to bet on unproven players. When Bill Belichick added Wes Welker to the Patriots for the 2007 season, Welker was coming off a season with Miami where he had amassed 687 yards. While a good showing by the young player, few may have expected he would go on to make 112 catches for 1175 yards with the Patriots in 2007. Fewer predicted he would follow 2007's success up by notching 1000 plus yard seasons in four of the next five years. If Coach Belichick weren't willing to keep an open mind, study the information and make a bit of a gamble, Mr. Welker may never have made those successful contributions. Similarly, not every stock in your portfolio has to be a nationally known name. Sometimes, good research and an understanding of a sector or industry's upside will present an underfollowed gem. When it does, don't be afraid to buy. 6. Adjust your strategy. When the Patriots faced off against the St. Louis Rams in 2001, the Rams were referred to as the greatest show on turf. Their quarterback, Kurt Warner racked up 375 completions and 36 touchdown passes. In the process, Mr. Warner amassed 4830 passing yards, good enough for second place all time behind Dan Marino (Drew Brees pushed Warner to the third spot in 2008). So, how did Bill Belichick, the defense guru approach the matchup? The team had already lost to the Rams earlier in the season despite blitzing Warner some 47 times. So, rather than blitz, Belichick put between 5 and 7 defensive backs in the backfield, essentially shutting down Warner's ability to find an open target. As a result, the Patriots were still able to pressure Warner as he was forced to remain the pocket longer. The lesson: always evaluate, consider and reconsider and be flexible enough to change your holdings when it makes sense. 7. Stretch the field. Having a fast footed wide receiver means every so often you can stretch the field with a long deep pass. Those long deep passes aren't common and are only taken when the odds favor it. But, every once in a while the connection results in a big gain or a touchdown. No team stretches the field on every play. But, taking an educated chance every once in a while can help your portfolio grow. Just make sure it's infrequent and sized correctly so it doesn't dominate your game. 8. Play short yardage. Stretching the field once in a while isn't a bad thing, but the core game should be played using slot receivers in route patterns and a running game. Those predictable plays move the chains 10 yards at a time. Your portfolio should be similarly managed, built around solid core holdings that are more consistent than they are volatile. 9. Limit mistakes. One of only a few signs hanging in the Patriots locker room reads "Penalties lose games". In the 2001 Super Bowl, the Rams were a victim of turnovers as the focus on defensive backs allowed the Patriots to make key interceptions. If the Rams had held onto the ball and played the playbook, the outcome might have been different. When it comes to picking winning stocks for portfolios, make sure you protect your capital. Sometimes, it's better to take the sack and sell the loser than compound the error by taking on more risk. 10. Think ahead not behind. Each game brings new challenges and opportunities. If you focus too much on last week's loss or win, you may take your eye off the week ahead. Instead of victory laps or pity parties, you should set your focus forward. By keeping your emotion in check and ignoring the temptations to extrapolate past failure or success into the future, you'll be better able to make necessary decisions to keep winning. 11. Have a set of rules. If Bill Belichick's wide receivers don't run the right route, the pass isn't going to be completed. If you're not willing to make the block, hustle on every down and protect the football, you'll find yourself spending time on the bench. A set of rules keeps you focused and disciplined. And, that focus and discipline will help you eliminate bad decisions. 12. Practice, practice and practice. Executing on the field begins with practice and continues with experience. The more practice and experience, the more likely you can successfully adapt to shifting formations on the field. The same applies to portfolios. The more you practice, the more you learn. 13. It's not about the talent, it's about the team. Some teams believe individual talent is more important than team chemistry. Those teams pack their offense and defense with pro bowl players without considering how they'll get along. Coach Belichick's teams like talent, but only if it adds to, rather than subtracts from, the team as a whole. Portfolios should be built similarly. No one should own a one stock portfolio. And since portfolios are made up of many different pieces, from stocks to bonds to commodities, you need to consider how all of them will act with one another. Is the portfolio too concentrated? Does the portfolio have too much beta? Are they all correlated with one another? Building a portfolio that works well together gives you a better opportunity for winning. 14. It's about the details. The Patriots spend lots of time breaking down film to understand how people react in different situations. They also spend lots of effort reviewing their own player's successes and failures. By keeping a journal of your investments you can see what works and what doesn't. You can evaluate when you did the right thing and when you didn't and learn to spot strengths or weaknesses in your approach. 15. Every week is different. No two opponents are the same. Some teams play strong defense. Others are great on offense. Some run the ball better, while others pass better. So, Bill Belichick approaches each week independently. By recognizing economic and seasonal cycles dictate when one strategy or investment works better than another, you can adjust your approach. Flexibility and open-mindedness will help you craft portfolios to the situation you're facing, which could boost your results. 16. Every battle is won before it is ever fought. The coach has a sign with Sun Tzu's famous saying on it up in the locker room. It speaks toward mental and physical preparedness. If you're a deep value investor you know what ratios are important to you. Perhaps you're looking at intrinsic value or price to sales, growth or earnings. If you're a growth investor, you're considering the sector and industry outlook and the company's market position within them. Either way, you're success relies on knowing your stuff. Proper preparation prevents poor performance. The more you prepare, including determining both why you're buying and why you'll sell, keeps you proactive rather than reactive.